Marine Directors: Highest level political group focused on ensuring the overall implementation of the Directive. 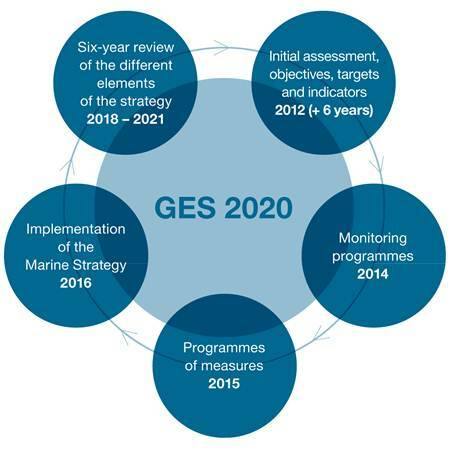 Marine Strategy Coordination Group (MSCG): Link between Marine Directors and Working Groups, preparing material for the Marine Directors and overseeing the work of the Working Groups. • WG on Good Environmental Status to support Member States in the determination of GES. • WG on Economic and Social Analysis to develop common methodologies and approaches to carry out the economic and social analysis of the use of the marine waters. • WG on Data, Information and Knowledge Exchange to support Member States with their data reporting obligations. Two technical subgroups, focusing on emerging areas of particular concern, underwater noise and litter, have been set up under WG GES to advise on the standardization of monitoring methods and provide a forum for exchange of principles and best practice on target setting and assessment methodologies.